Have you ever wished your passport could fit inside your wallet? It can! You can get a US passport card, whether or not you currently hold a passport book. 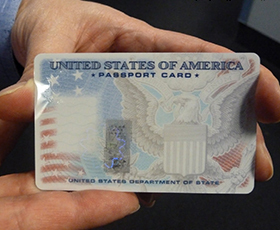 A passport card is the same size as a driver’s license, and is official proof of your identity and US citizenship. They are particularly useful as identification for children who are too young to get a driver’s license. The main difference between a passport card and a passport book – other than the physical size and format – is that the card can not be used for any international travel by air. Any time you board an international flight, you will need a valid US passport book. Get Expedited Passport Services Today! Passport cards, like passport books, are valid for 10 years from the date of issue (or 5 years, for children age 15 and younger). If you already hold a passport book, your card will be issued with a different number. You do not need a valid passport book in order to apply for a passport ID card, and you can apply for either the card only, or you can apply for a passport book and a passport card at the same time. You’ll find all the details you’ll need to apply for a passport card in our guide, including the requirements and how to get it fast. Who is Eligible for a Passport Card? All US citizens are eligible to obtain a passport card. It does not matter if you currently have a valid passport book or not. 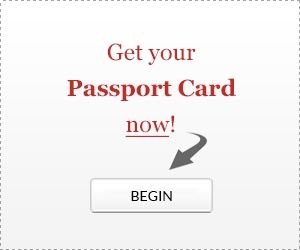 You can get the card even if you have never been issued a passport before. Where Can You Go With a Passport Card? US passport cards can be used to enter Canada or Mexico by land or sea. That means you can use a passport card if you are going to Mexico or Canada by car, bus, train, ferry, yacht, or even on foot! Your passport card can also be used to enter most Caribbean nations by sea. The Caribbean island nations that accept the US passport card include Bermuda, Jamaica, Aruba, the Bahamas, the British Virgin Islands, and Dominican Republic. No matter where you are going, you will need a passport book if you are traveling internationally by air. Most cruise lines also will want you to have a valid passport book, in case you have to fly home in an emergency. What Is a Passport Card Used For? You can travel to Canada, Mexico, or most Caribbean nations by land or sea. You can use your passport card as Real ID to board domestic flights in the US or enter US military facilities or federal buildings. Your passport card can be used as an ID card for purposes like buying alcohol, getting a driver’s license, or checking in at the doctor. If you ever lose your passport book, you can use your passport card as proof of citizenship. While you are traveling overseas, you can carry your passport card in your wallet so you can prove your identity and citizenship. You can keep your passport book safe at the hotel if you also have a passport card! Passport Application Form (DS-82), completed offline or filled out online at https://pptform.state.gov/, printed and signed. You will need to select on this application whether you are applying for just a passport card or for both a passport card and a passport book renewal. Once you have collected these items, you can proceed to Step Two. New Passport Application Form (DS-11), completed offline or filled out online at https://pptform.state.gov/. You will need to specify on the application whether you are applying only for the passport card or for both a passport book and a passport card. Photocopy of your driver’s license or other state-issued ID (front and back). Minors under age 16 will need to submit copies of both parents’ passports or driver’s licenses. Passport card fee – you will need two checks, one for $25 for the Passport Acceptance Agent fee and one made payable to “US Department of State” for $30 ($15 for applicants under age 16.) Add $60 to the US Department of State check if you need expedited service for your passport card. You will need to appear in person at a Passport Acceptance Agent in order to have your documents reviewed and sealed into an official envelope before you proceed to Step Two. Children under age 16 will need to appear at the Passport Acceptance Agent with both of their parents. (See our Passport for Minors page for more details.) Passport Acceptance Agents are usually found at major post offices or at Clerk of the Court offices. You can find a convenient passport location. By Mail – Your passport card application can be sent in by mail to be processed at the National Passport Center. At a Passport Agency – If you need expedited service for your passport ID card, you can visit a US Passport Agency in person. By a Passport Expediting Company – If you really need to get your passport card fast, you can send your application to a reputable passport expediting company for service in as little as 24 hours. Applying for a passport card by mail will take up to 8 weeks. If you are also applying for a renewal of your passport book and you opt for expedited service by mail, your passport book will arrive in 2-3 weeks, but your passport card may arrive in a separate envelope several weeks later. Passport cards requested by mail are always shipped back to you via First Class Mail (regular mail). If you need your passport card in a hurry, the best way to do it is to use the services of a passport expediting company. These companies can get you a passport card in as little as 24 hours. You can request expedited service by appearing in person at a Passport Agency, but not all Passport Agencies make passport cards on site. You may still need to wait 2 or more weeks for your passport card to be sent to you by mail. There are 26 Passport Agencies across the US, and you must call the National Passport Information Center at 877-487-2778 to make an appointment. Many Passport Agencies will not allow you to appear in person unless you have proof of very urgent travel.